‘Conversions’ is the most commonly used conversion metric as it refers to the total number of conversions that occurred. Conversions are represented by a number between 0 & ∞ (although we have never seen infinite conversions!). Conversions and conversion tracking underpins one of the biggest differentiator between paid search and traditional marketing... They allow us to track and attribute value to the most granular level. This gives paid search marketers the ability to fully demonstrate with hard data the value of their work. Conversions allow you to understand the value of Clicks and the performance of ads, campaigns, etc. There is a ‘conversion window’ in which a conversion can be attributed to a channel or Click. This conversion window is typically 30 days, but can be changed manually. 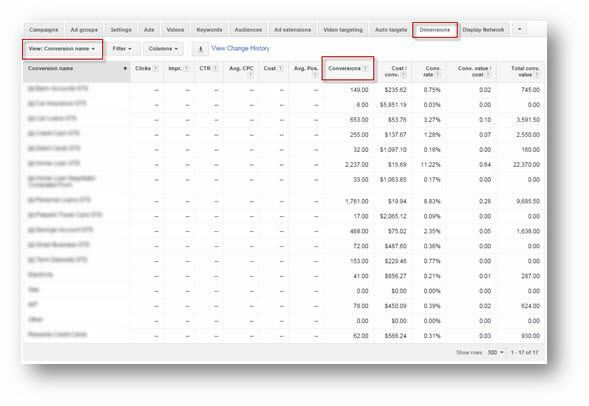 Reducing this conversion window reduces the volume of conversions recorded in AdWords. A user on your site could convert multiple times, for example; they could purchase two products and download a file (resulting in 3 conversions). This would be counted as 1 ‘Converted Click’ or 1 ‘Converted User’. In addition to total account conversions, it is possible to segment conversions by campaign, ad group, keyword, placement, and ad. Conversions essentially equate to the collective purchases (conversions) of all customers / users; whereas a converted click is basically a unique customer. A good analogy of this would be a customer in a supermarket that buys 4 bananas... This would be the equivalent of 4 conversions but only 1 converted click. To use an example in AdWords; if we imagine a campaign that received 40 Conversions and 300 Clicks, but it is the case that all 40 of those conversions came from just 30 Clicks... we would have 40 conversions and just 30 Converted Clicks. Consequently this metric is used a lot in reporting. Conversions can be seen in most reports within AdWords by default, this is also the case even if you are not tracking conversions. Many businesses have multiple conversions and each with different values, you can see performance for each in the ‘conversion name’ report within the Dimensions tab. Viewing conversions as a total can often be misleading, especially when those conversions have different values. If you have a conversion with a value of $100 and another with a value of $10, aggregating all conversions into a single metric holds little value. The screenshot below shows in blue the top level data for the campaign and then nested underneath you can see all of the conversions (conversion names) and their data individually. If you scroll to the bottom of the page and expand the “Total - all enabled campaigns” drop down, you can see the aggregated data across all campaigns for each conversion name. From here you can see how many conversions each conversion name received. You may have noticed that standard performance data such as Clicks, Cost, etc are not present for each conversion name, this data exists only at the top level and not at the conversion name level. As mentioned earlier, attribution is one of the defining differences between paid search and traditional marketing. 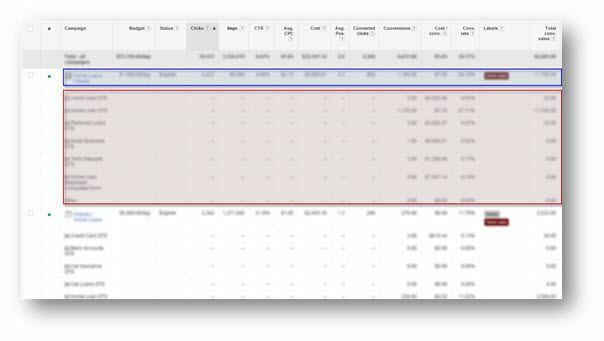 Having conversion tracking setup enables us to perform attribution modelling, to better understand what ‘world view’ value works best with our customer behavior. For this, there is a suite of attribution metrics that all use conversion data. We cover these in more detail in other guides.